If you have silver items that you want to sell bring them to our shop located near the Milwaukee, Waukesha, Brookfield area, so our buyers can offer you a fair price. Interested in buying silver candlesticks, sterling flatware, silver teasets, fine silver, turquoise jewelry, and silver coins made in 1964 or earlier. If you are unsure of your items value, stop in with items, so we can evaluate and give you a price. We pay cash giving you the most reasonable price based on the type and condition of the item. 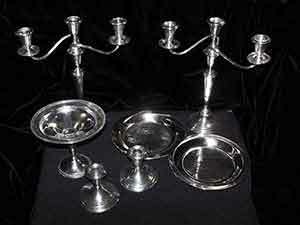 We also purchase entire fine estate collections. Where to sell your silver? Where to sell your sterling silver?